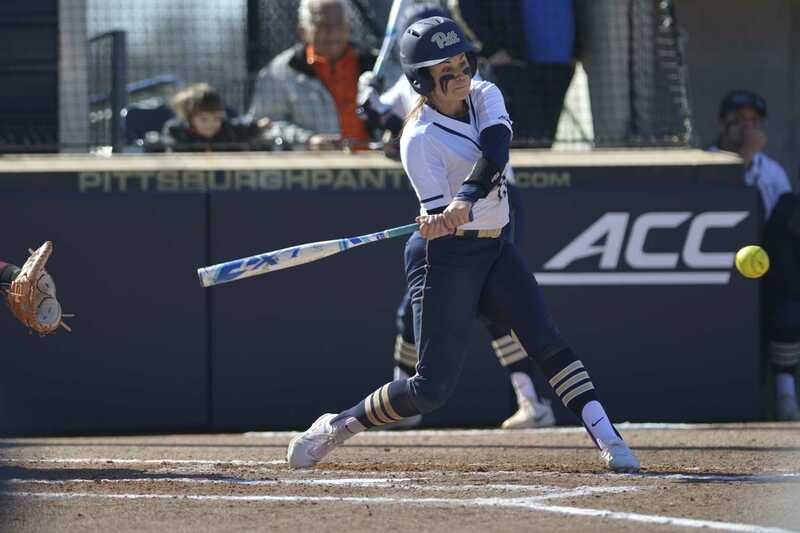 Pitt softball moved to within two games of first place in the ACC coastal division after winning their second game in a row, 6-4, against the Kent State Golden Flashes Wednesday. Coming off a series win against Georgia Tech, the Panthers (23-16-1) looked to remain on track on what’s been a somewhat up-and-down season. In what was the first of two matchups between these two clubs, Pitt’s win against the Golden Flashes (20-20) broke the squad’s three-game nonconference losing streak. Senior third baseman McKayla Taylor kicked off the offense for the day, scoring on a wild pitch by Kent State sophomore pitcher Kristyn Eckl, giving the Panthers an early 1-0 lead in the first inning. Pitt tacked on another run in the top of the third inning as junior shortstop Olivia Gray scored due to a fielding error by Kent State junior first baseman Hunter Brancifort. Panthers senior pitcher Kayla Harris found herself in trouble for the first time of the game in the bottom of the third inning as the Golden Flashes were threatening with runners on first and third with two outs. Harris pitched herself out of the jam, getting senior second baseman Vanessa Scoarste to pop out to end the inning. With two runners on and one out, Taylor launched a three-run shot to give the Panthers a commanding 5-0 lead in the top of the fourth. Taylor finished the game 2-for-4 with three RBIs and two runs scored. Taylor has had a strong season so far, as she’s second on the team in home runs with six, and fourth on the team in runs batted in with 17. Pitt put up its sixth run of the game as Gray scored on another fielding error, misplayed by first-year shortstop Alexis Taube. The Panthers remained far ahead after four innings of play, 6-0. After relieving Harris in the fifth inning, junior pitcher Taylor Rahach walked the bases loaded in the bottom of the sixth inning. Unable to avoid the big blow, Rahach yielded a pinch-hit grand slam to Kent State senior infielder Holly Speers. Harris would reenter the game for Pitt, retiring the next two batters to end the inning, preserving the Panthers’ 6-4 lead. Kent State failed to complete the comeback, as Harris closed out the last 1 2/3 innings to seal a 6-4 Panther victory. Harris finished the game with four strikeouts, two hits, one walk and no runs over 5 2/3 innings of work. Rahach went 1 1/3 innings allowing four runs on three walks and one hit while striking out two. Pitt’s offense has continued to produce, going 8-for-30 as a team and scoring at least six runs in its last three games. The Panthers will host Virginia this weekend for a three-game series beginning this Friday. First pitch is 5 p.m. at Vartabedian Field.